We got an early start. Again we were the only people eating in the Canterbury Gate Hotel breakfast room. Since it wasn’t too far, we decided to walk to the train station pulling our luggage. There was one train to London Waterloo East. At Waterloo we had to go into another station to catch the train to Salisbury. 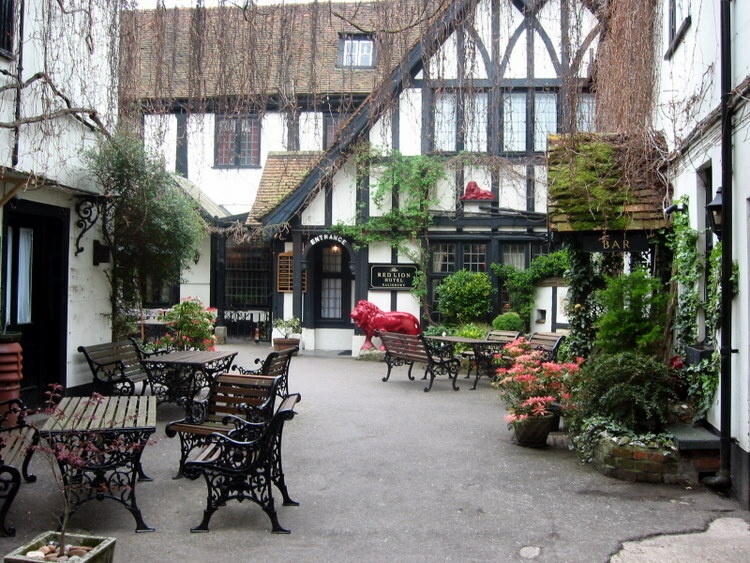 When we arrived in Salisbury, we took a taxi to our hotel, the Red Lion. This hotel was built nearly eight hundred years ago to house the draughtsmen working on the nearby cathedral. 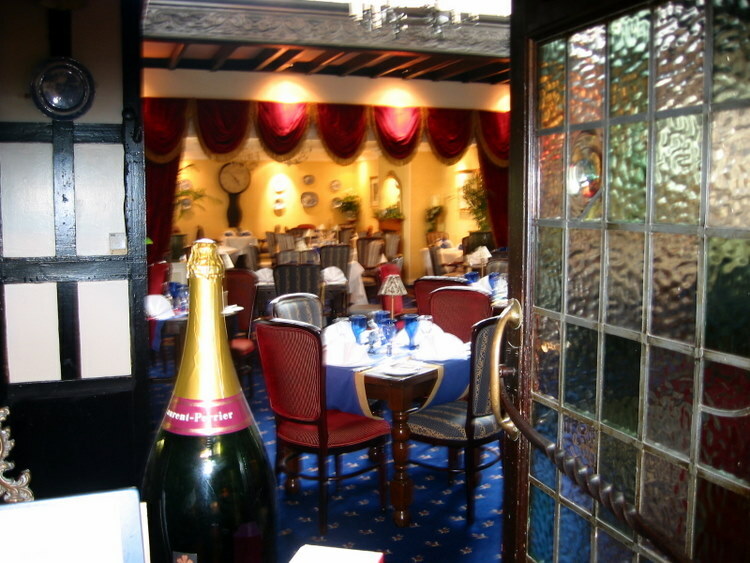 It has been in the ownership of the Maidment family for nearly 100 years. It was charming. Our room was decorated in fancy red and black accessories with timbered walls. There was a small stuffed lion on the bed. My wife slept with it both nights. We had a large bathroom and a wonderful tub. We had lunch in the hotel lunch room which was crowded. We ordered at the counter, paid and then took our table. We had to share a table with several locals. We had an after lunch appointment for a tour of Salisbury Cathedral. 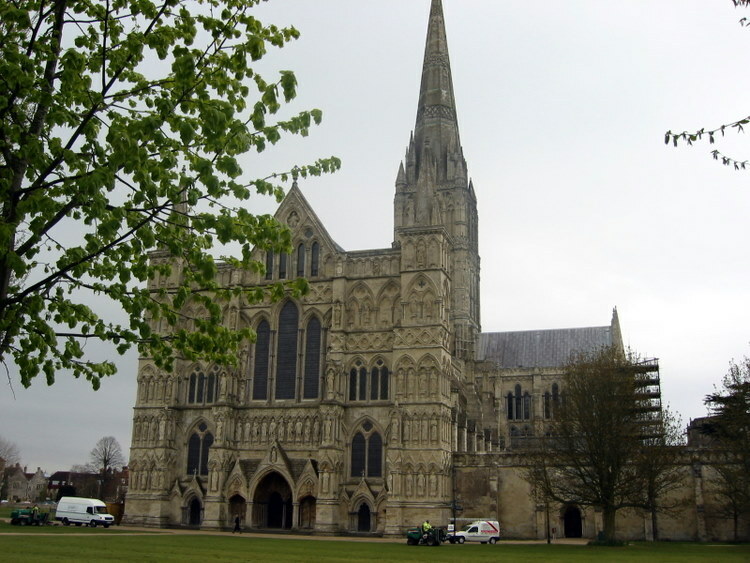 One of the most impre ssive aspects of the Salisbury Cathedral is its location. It is located in the center of a large grassy area within the Close of the cathedral. One does not have a problem of taking pictures of the en tire cathedral from many different angles. We checked in the office, and they were waiting for us. 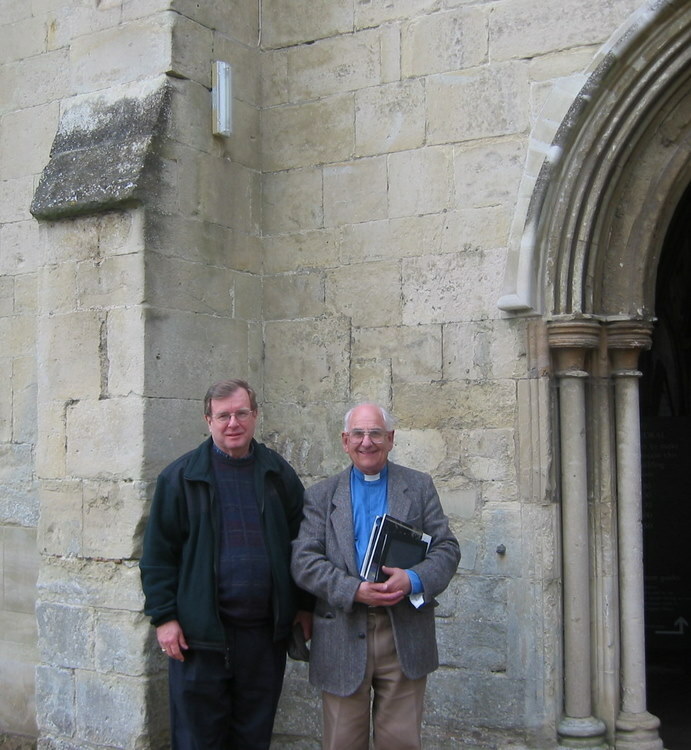 Our guide was The Reverend Canon David Byford, who was a retired canon. He gave us a wonderful tour of the cathedral plus all the buildings on the close including the school, vestry, and choir room which had 12th century tiles. We took a coffee break in an amazing room that had been built in part of the cloister. It had a glass ceiling through which one could see the tower and the roof of the cathedral. Our tour lasted from 2:15 until 5:30. 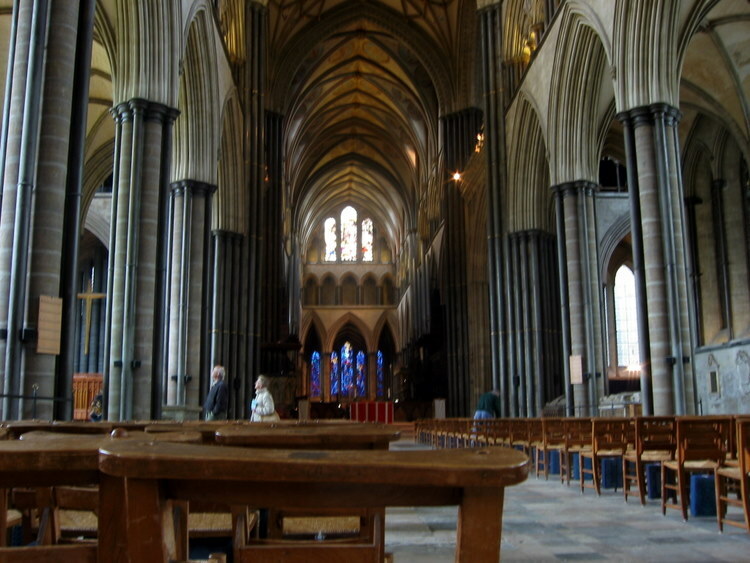 Unlike Westminster Abbey and Canterbury Cathedral, the Quire or Rood Screen of Salisbury Cathedral had been removed, which provide a clear view of the entire nave, choir and sanctuary and the high altar. The screen had been removed in 1790 and placed against the wall in the Morning Chapel. 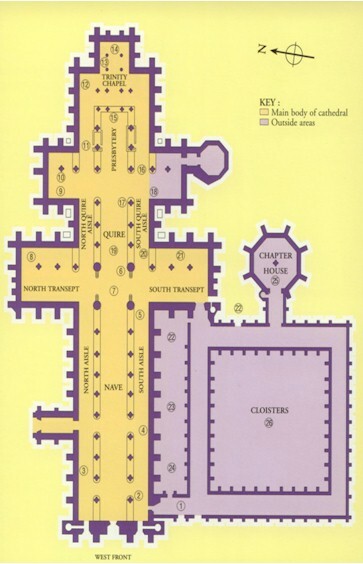 Many churches that we will visit will use the design of the Roman Basilica as the style along with the floor plan in the shape of a Roman Cross. The arms of the cross are known as transepts. In Salisbury cathedral there are smaller versions of the transepts between the regular transepts and the east end of the church. The Morning Chapel is located in the north one. The elevation model (on the right) compares the wall elevation of Salisbury Cathedral - 81 ft (on the right) to the Washington Cathedral -100 (on the left). You will note that the clerestory windows in the Washington Cathedral are taller but the triforium openings in Salisbury are wider. 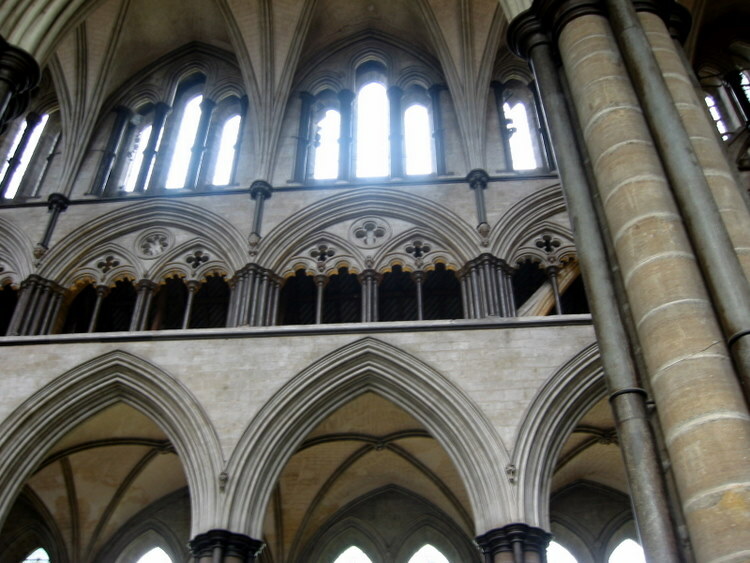 Most of the windows in the clerestory at Salisbury are clear instead of stained glass. For more detail on the wall elevation parts click here. 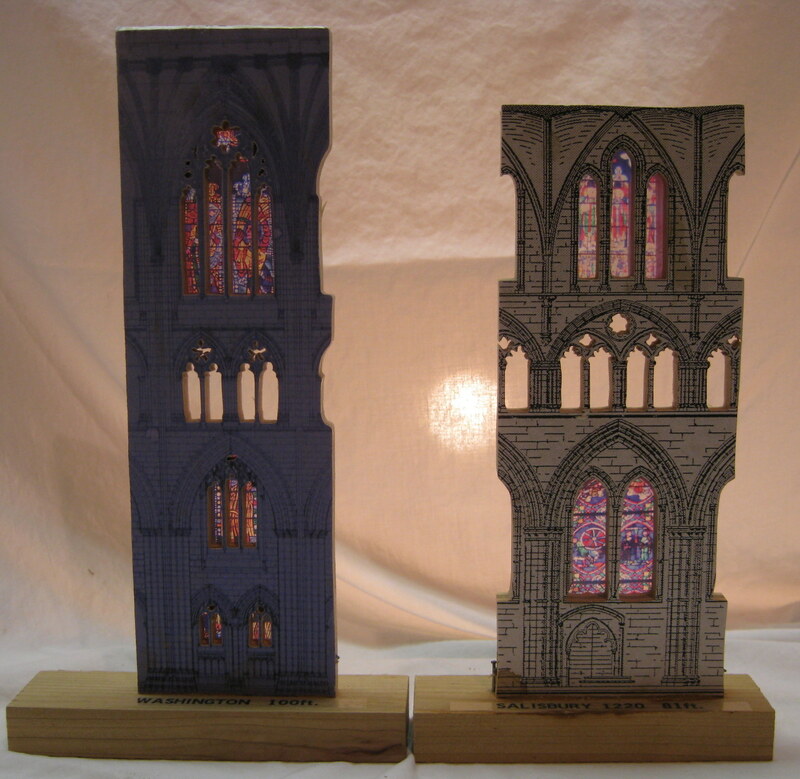 Due to the weight of the tower there were addition buttresses and supports added to the north and south transepts. 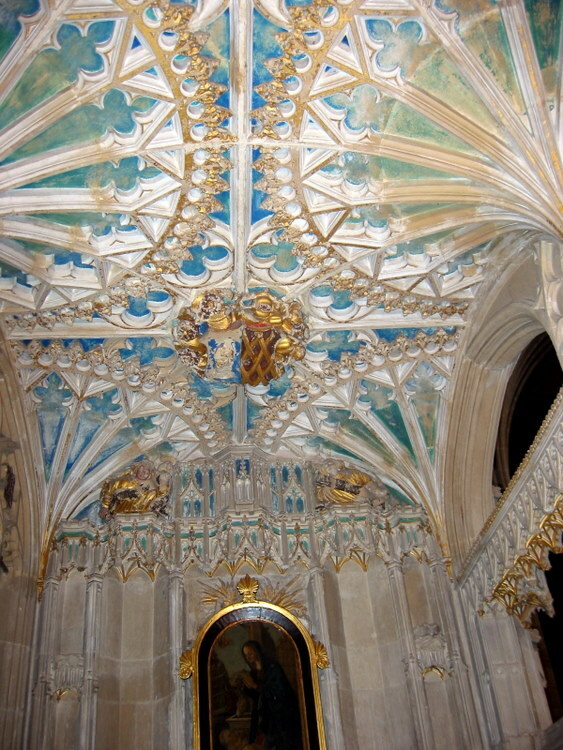 It has the appearance of scissor arches that we will soon see in the Wells Cathedral. 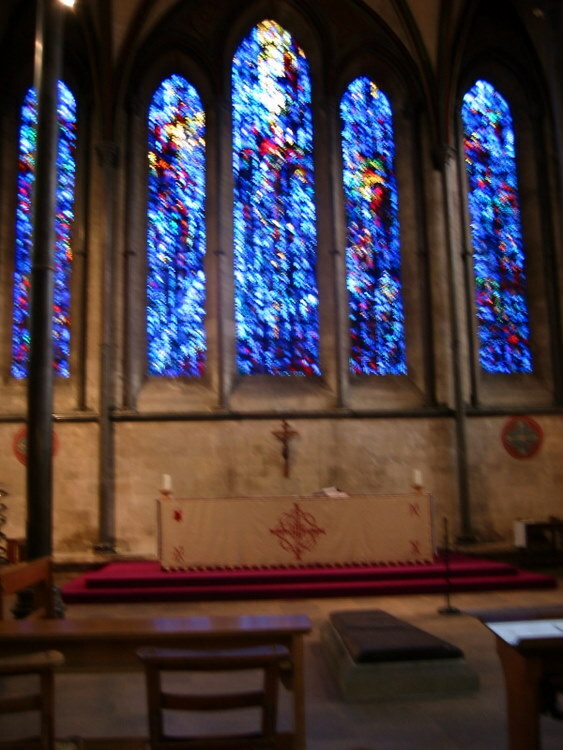 Behind the high altar in the ambulatory is The Trinity Chapel with beautiful stained glass windows which are dedicated to prisoners who suffered for their belief. 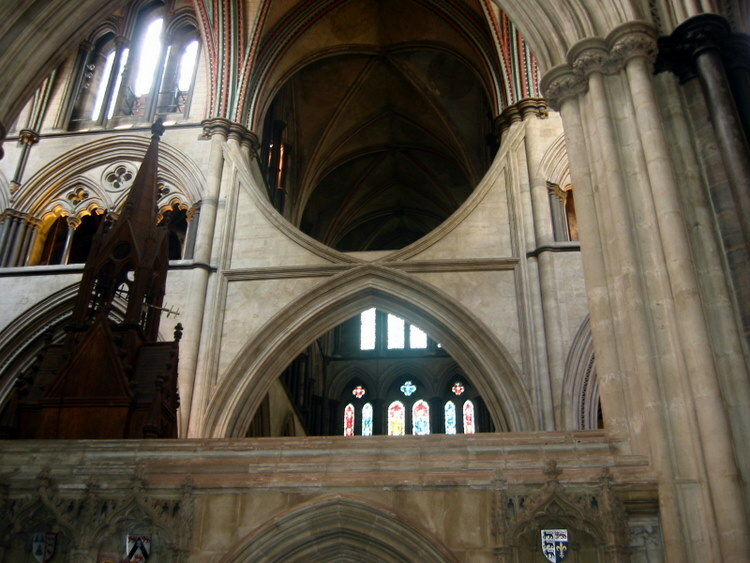 The wall containing the window is flat because the area normally designed as an apse is square rather than rounded or multiple sided as we will see in other cathedrals. There are a number of tombs and mon uments in the nave. Near the Presbytery (the section of the quire area that contains the high altar) and the Morning Chapel is the only chantry that remains in the cathedral. It is like a small building/chapel with a fan tracery ceiling. It is a memorial to Bishop Audley (died 1524). It is still in use. The vaulting above the Quire shows Christ and the apostles along with the patriarchs and prophets. 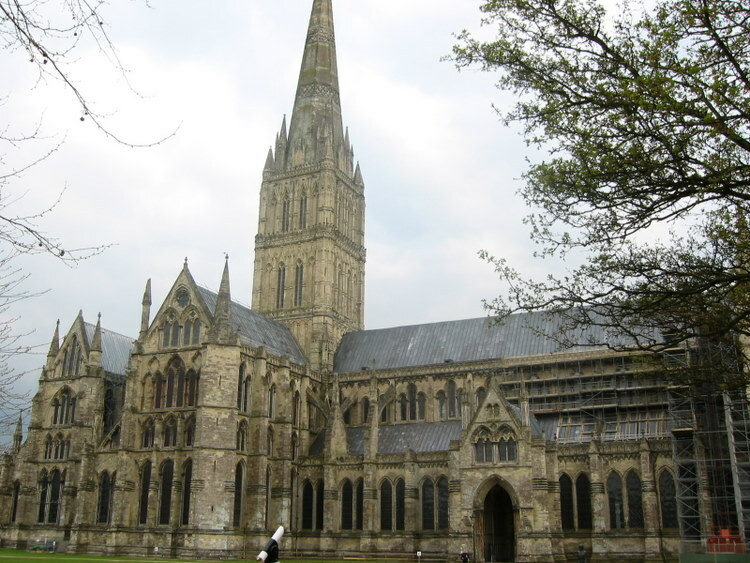 Salisbury and the surrounding area have a very long and fascinating history. For an understanding of history, I would recommend Edw ard Rutherfurd’s epic novel, Sarum. For more than 3500 years Wiltshire and surrounding towns have been the center of religious worship. Stonehenge dates back to 1800 B.C. Old Sarum, two miles from the present cathedral dates to 160 A.D. The cathedral was in the line of fire from the castle which caused the church to be damaged often. Not only was there a lot of noise but the soldiers often interfered with the services. In 1217 Bishop Richard Poore petitioned the Pope to move his cathedral elsewhere. In 1220 he began build his Gothic cathedral in his present location. It was build with great haste and finished in 38 years. Seven years later the front façade was completed. The tower and spire were added between 1297 and 1320. The weight of an additional 6500 tons of stone on the four piers and the central crossing caused them to bend, so buttresses had to be build in the triforium and clerestory to support them. In 1450 additional bracing arches at the north and south sides of the central crossing were added. 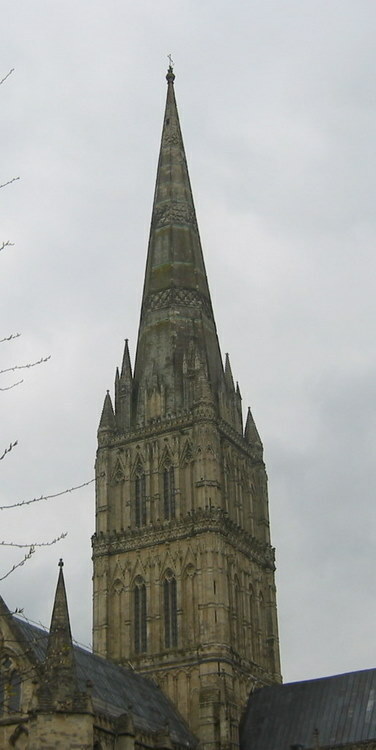 The octagonal spire is the tallest and the most elegant in England. It rises 180 feet above the tower for a total of 404 feet. The top 30 feet were rebuilt between 1949 and 1951. Both the tower and the spire were extensively restored between 1986 and 1996. We attended a “said” Evensong in a retro choir in back of Trinity Chapel. There was a Prisoners of Conscience, Amnesty International candle surrounded by barbed wire. We were impressed that all of the cathedral clergy were present. They were very welcoming. After a nap at the hotel, we went to the dining room for dinner. We ordered two of things we usually have one of - two starters and two desserts (we were bad!!!). We had lamb and steak. The room picked up the red colors. Dinner wasn’t really spectacular but good. There were too few people and no music; however the service was polite.